Kleefeld on Comics: Has Anyone Really, REALLY Read The Galactus Trilogy? Has Anyone Really, REALLY Read The Galactus Trilogy? Over at The Hooded Utilitarian, Ben Saunders ponders the question: has anyone really read Action Comics #1? He mostly looks at it from the perspective of the fact that, even as early as the mid-20th century, very few people had access to an original copy of the seminal comic book and the vast majority of us are relegated to reading reprints and digital copies. He brings up several salient points around the question, but only briefly touches on one that I think is quite significant. When I first really started getting into comics as a kid, Fantastic Four was my favorite title. John Byrne was working on it at the time, and he was turning in amazing work month in and month out. In hindsight, it's really easy to see how I was hooked. After reading the book for several months, I realized that there were 200-some issues that came beforehand that I ought to read since I liked the characters so much. And the back issue hunt began. But you know what I recognized even then? That I wasn't really experiencing the books "properly." By the time I read the famous Galactus Trilogy -- even the original copies -- I knew who Galactus was, how he operated, and much of his backstory. I'd already seen this world-eating giant physically beaten by Earth's heroes, saved by Reed Richards and legally defended by Odin! There was absolutely no way I could remove that context from my head while I was reading the character's debut. There was absolutely no way that I could experience seeing that character for the first time from his 1960s debut because I had already experienced him in the 1980s. A few years later, Jim Lee was given the reigns of the book for a spell during Marvel's "Heroes Reborn" event. I was reading all the "Heroes Reborn" books at the time, and I distinctly recall getting excited about the impending finale with Galactus. Primarily because I didn't know what was going to happen. The way that series was set up -- essentially putting the old characters in an alternate reality with no ties to existing continuity -- meant that it could potentially even end with the destruction of the world and all its heroes, since it wouldn't impact/affect the "real" Marvel Universe. I believe I even said at one point that it would probably be the closest feeling I would get to reading the original Galactus Trilogy when it first came out. But that still happened in in 1997, not 1966. Over three decades apart. Galactus debuted before Watergate, before Star Wars, before MTV, before home computers... before everything that made 1997 what it was. There was no way I could experience the Galactus Trilogy in the "proper" context because I hadn't even been born in 1966! Art is a reflection of the society in which it's created. 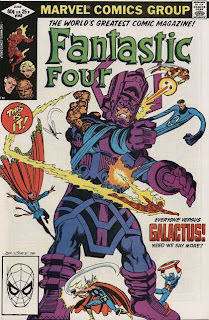 Everything that was swirling around the collective social consciousness in 1966 informed how the Galactus Trilogy was created and how it was received. The further removed you are from that, the further you remove yourself from the original context. Even someone reading it in 1967 would have a slightly different context than anyone who read it the year before. Star Trek, for example, debuted a few months after the Galactus Trilogy concluded. So did The Monkees' first album. The Black Panther Party was created. Walt Disney died late in the year. Even within the span of a few months after the books were published, people were reading them in a different context because they had other things to contextualize the story against. I specifically choose the Galactus Trilogy for my example here because it's a story that was quite powerful when it first came out. "Have the FF fight God" was the anecdotal inspiration for the story (and one that I dig up evidence for being reasonably accurate in an upcoming-but-not-sure-which issue of Jack Kirby Collector) and that made for a huge sea change in comic storytelling. At Marvel certainly, and eventually over at DC as well. The people who would've read it in 1966 and still working/playing in the industry are relatively few and far between, putting the book substantially into comics' past. But it's still recent enough that obtaining original copies is not all that difficult. So you can see/hear/feel the original and compare that against a reprint, but it's not something you're likely able to fully put into context. Because it's no longer 1966. So, in that sense, does it even matter whether you read the original or a reprint or a digital copy? I don't know, but I think it's a relevant point that, as I said, Saunders touches on but doesn't explore very deeply. I didn't know you had a #1. How rough is it? As for context, I think that aside from the difficulty in determining the full details which provide for a "true" reading of something even at its original time, things can gain as well as lose over time. The Dark Phoenix Saga has probably lost heavily in terms of impact since the late 1980s. On the other hand, I've always thought Warren Ellis's Doom 2099 stories from the late 90s gained a lot over the subsequent decade; they were written as a satire of contemporary America originally but I think that satire became much more pointed (to a frightening degree in fact) in the context of America's government from 2001-2008. Oddly enough, I did read the Trilogy in 1966...but at the tender age of six I was not really plugged in to the zeitgeist enough to appreciate the greater context. Still, as a regular reader of FF at the time, I remember being on pins and needles as the whole thing unfolded. @Matt -- It's rough. Probably about as poor a grade as you could get but still have it complete and in one piece. @Johnny -- Haven't seen/heard from you in a while! Good to see you're still out there! I don't think I could really imagine the excitement of reading the Galactus Trilogy as it happened. And to have it continue over three issues? Especially at age six, the month-long wait between them must have been excruciating! I didn't read the Trilogy until around 2004 when I got back into reading FF. My senior year of college, a friend had given me some of Waid's recent work, and I was immediately hooked again, like when I was reading Walt Simonson's work in '89 when I first picked up an FF. I then set about filling in the many gaps in my collection, and the Galactus Trilogy was one of my first completed goals, and I actually read those issues, something I can't say for many of the Lee/Kirby issues. But even despite knowing what happened, reading about it, though never actually read any reprints, I still relished every panel of that story, even almost 40 years after the fact. Eight years later, I'm still filling in the gaps, but they are now all below #10 and I doubt I'll every get them filled until after I've completed my PhD and found a real job!